Scooper - Technology News: If your grandparents were wealthy, will you be? If your grandparents were wealthy, will you be? The most recent strand in the literature on intergenerational income mobility looks beyond the two-generational model and focuses on the role of grandparents (e.g. Clark 2014, Lindahl et al. 2015). However, so far there have been few studies of such multigenerational patterns in the wealth distribution, and on the mechanisms accounting for it. Exceptions are Boserup et al. (2014) using Danish register data, Pfeffer and Killewald (2015) using US survey data, and Clark and Cummins (2014) using rare surnames to link generations in England and Wales, who find that grandparents do seem to have an influence over and above that of parents. In a new study, we look at the intergenerational transmission of wealth across four generations, spanning the entire 20th century (Adermon et al. 2016). We follow individuals born in Sweden's third largest city, Malmö, in 1928, and track their parents, children, and grandchildren, observing their wealth at mid-life (ages 40-60) for the first three generations and around age 20 for the fourth generation. We also observe inheritances received by the second generation. The fact that we observe wealth at mid-life and inheritances makes this a unique dataset in the literature. Our findings regarding the role of parents, grandparents, and great grandparents are relatively similar to previous studies, but with some differences. Looking at the wealth rank association between parents and children, we find that for the second generation (born in 1928) a 1% increase in the parental wealth ranking is associated with a 0.3% increase in the child's wealth ranking. For the third generation (born in the 1950s) the corresponding association is around 0.4%, indicating that intergenerational wealth persistence has been going up over time. Persistence is stronger in the top of the parental wealth distribution throughout, indicating a non-linear relationship in wealth mobility. The role of grandparental wealth for their grandchildren appears to be positive. We find a relatively strong direct association between them (Figure 1), but when we control for parental wealth it becomes smaller and in most specifications, statistically insignificant. Great grandparents exhibit a similar association, being large when measured directly onto great grandchildren but not surviving conditioning on intermediate generations. Several potential determinants could explain intergenerational wealth persistence, for example intelligence, patience, social skills, norms, or bequests. Unfortunately, most of them are almost impossible to measure with respect to their influence on mobility, but bequests and gifts represent a possible determinant that is both observable and identifiable. We estimate the role of bequests and gifts for wealth mobility, which is a new contribution to the literature. While there are other recent studies that also examine the role of transfers for wealth transmission (Fagereng et al. 2015 for Norwegian adoptees; Black et al. 2015 for Swedish adoptees; Pfeiffer and Killewald 2015 for the US), we make the only contribution that directly observes inheritances received from both parents – a fact that appears to be crucial since surviving spouses typically retain most of the parental estate until their own death. Two complementary models are used. First, we run intergenerational regressions of child wealth on parental wealth and the size of inheritance. 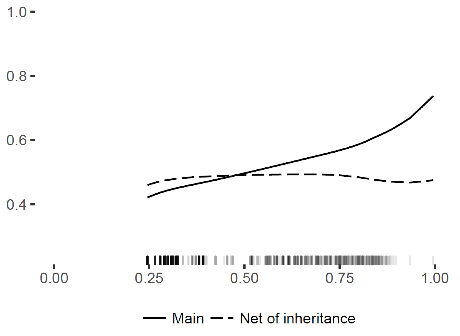 Without inheritances, the association between parental and child wealth rank is 0.26 (slightly lower than above because of a slightly smaller sample), but when controlling for inheritance the association shrinks by more than half to 0.12. Taken at face value, this suggests that 54% (1-0.12/0.26) of the original parental transmission is due to inheritances. Our second strategy is to purge child wealth of the observed inheritances (adjusted for the time elapsed between inheriting and our measure of child wealth). Rerunning the regressions for this ‘net-of-inheritance’ child wealth gives an association with parental wealth that is insignificant and close to zero, thus confirming the first test’s result of inheritances playing a very big role for wealth mobility. Figure 2 shows this parent-child association with and without inheritances. Finally, we examine the role of other potential driving factors: earnings and education of both parents and children. Controlling for both earnings and education, the wealth association falls by about one quarter, from 0.29 to 0.21. This is a substantially smaller reduction than what we find when controlling for inheritance. Our study adds two distinct contributions to the small but growing literature on intergenerational wealth mobility. First, most of the observed transmission in wealth status between generations comes from parents, with grandparents contributing rather marginally. Second, most of this parental transmission appears to be due to bequests and gifts. The implications of these findings for the broader issues of equality of opportunity and fairness in the wealth distribution are something that we hope to be able to study further. Adermon, A, M Lindahl, and D Waldenström (2016), “ Intergenerational wealth mobility and the role of inheritance: Evidence from multiple generations ”, CEPR Discussion Paper No. DP11456. Black, S, P Devereux, P Lundborg, and K Majlesi (2015), “Poor Little Rich Kids? The Determinants of the Intergenerational Transmission of Wealth”, IZA Discussion Paper No. 9227. Boserup, S H, W Kopczuk, and C T Kreiner (2014), “Intergenerational Wealth Mobility: Evidence from Danish Wealth Records of Three Generations”, Working Paper, University of Copenhagen. Clark, G (2014), The Son Also Rises: Surnames and the History of Social Mobility, Princeton, NJ: Princeton University Press. Clark, G, and N Cummins (2014), “Intergenerational Wealth Mobility in England, 1958–2012: Surnames and Social Mobility”, Economic Journal 125 (582), 61–85. Fagereng, A, M Mogstad, and M Rønning (2015), “Why do wealthy parents have wealthy children?”, mimeo., Statistics Norway. Lindahl, M, M Palme, S Sandgren Massih, and A Sjögren (2015), “Long-Term Intergenerational Persistence of Human Capital: An Empirical Analysis of Four Generations”, Journal of Human Resources, 50 (1), 1-33. Pfeffer, F T, and A A Killewald (2015), “How Rigid Is the Wealth Structure and Why? Inter- and Multigenerational Associations in Family Wealth”, PSC Research Report No. 15-845.